Dingell was the longest-serving member of Congress in U.S. history. Former Rep. John Dingell Jr., the longest-serving member of Congress in U.S. history, died Thursday, his wife and successor, Rep. Debbie Dingell, announced in a statement. 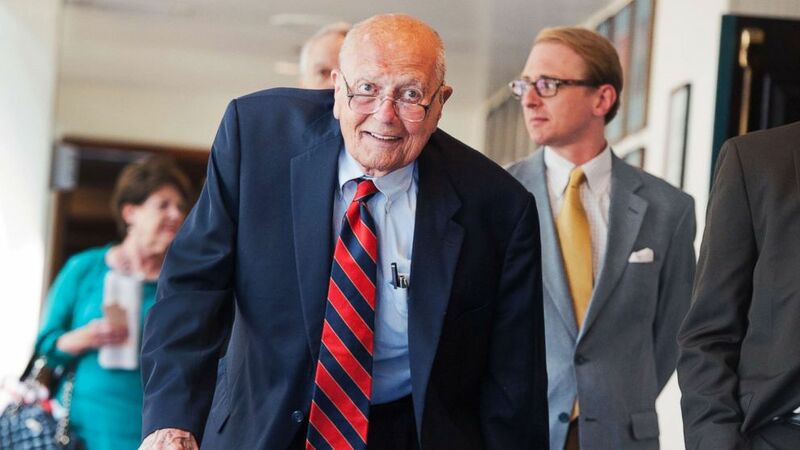 (Tom Williams/CQ Roll Call/Getty Images) Rep. John Dingell, D-Mich., arrives at the National Press Club to speak at a luncheon, June 27, 2014. Today the great State of Michigan said farewell to one of our greatest leaders. John Dingell will forever be remembered as ‘The Dean’ of Congress not simply for the length of his service, but for his unparalleled record of legislative accomplishments. Dingell, age 92, was known to have been in declining health in recent months. He also suffered a heart attack Sept. 17, 2018. On Wednesday, a source close to the family confirmed he had cancer and was receiving hospice care. Wednesday evening, John Dingell tweeted appreciation for the outpouring of support he'd received. The Lovely Deborah is insisting I rest and stay off here, but after long negotiations we've worked out a deal where she'll keep up with Twitter for me as I dictate the messages. I want to thank you all for your incredibly kind words and prayers. You're not done with me just yet. (REX via Shutterstock) Robert Byrd, former U.S. 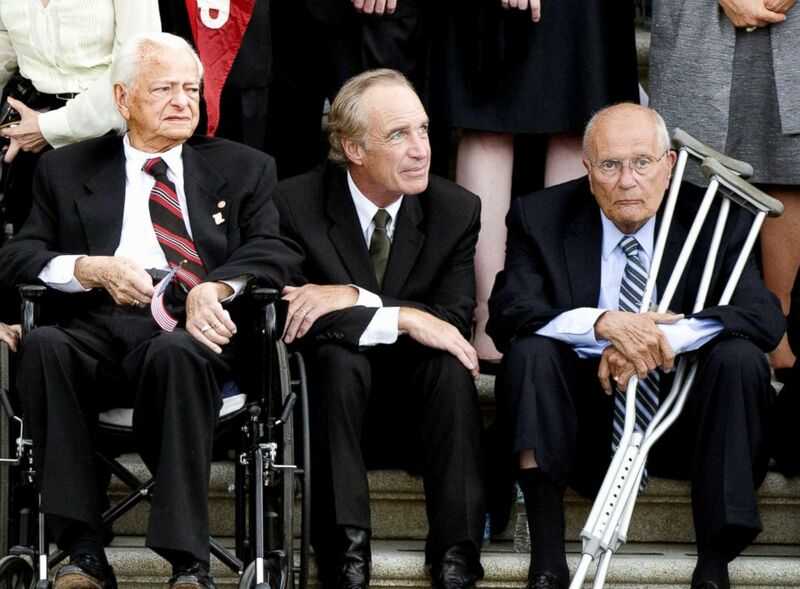 Senator Dirk Kempthorne and Representative John Dingell await the arrival of the body of former U.S. Senator Edward M. 'Ted' Kennedy at the U.S. Capitol Funeral Procession for Senator Edward Kennedy, in Washington D.C., Aug. 29, 2009. "The Lovely Deborah is insisting I rest and stay off here," he wrote, "but after long negotiations we've worked out a deal where she'll keep up with Twitter for me as I dictate the messages. I want to thank you all for your incredibly kind words and prayers. You're not done with me just yet." Debbie Dingell was not present for President Donald Trump’s State of the Union address Tuesday evening, prompting her to explain her absence. The two were married in 1981. Dingell succeeded his father, John Dingell Sr., at age 29, taking office on Dec. 13, 1955, and serving 30 terms in the House of Representatives. He retired January 3, 2015, after a storied career inside the Capitol – particularly on the House Energy and Commerce Committee, where he served two stints as chairman. Dingell was drafted into the U.S. Army, serving from 1944-1946, achieving the rank of second lieutenant. He did not deploy overseas to a theater of war during World War II. Former President Bill Clinton tweeted about Dingell Thursday night. "There are few major legislative triumphs since 1955 that he didn’t have a key hand in passing," Clinton wrote. "Hillary & I are grateful to have worked with him & called him our friend." For nearly 60 years, John Dingell represented the people of Michigan with honor, integrity & great good humor. There are few major legislative triumphs since 1955 that he didn’t have a key hand in passing. Hillary & I are grateful to have worked with him & called him our friend. Sen. Debbie Stabenow, D-Mich., remembered Dingell in a statement. In a Twitter thread, Michigan Gov. Gretchen Whitmer remembered him. She wrote, "Today the great State of Michigan said farewell to one of our greatest leaders. John Dingell will forever be remembered as ‘The Dean’ of Congress not simply for the length of his service, but for his unparalleled record of legislative accomplishments." 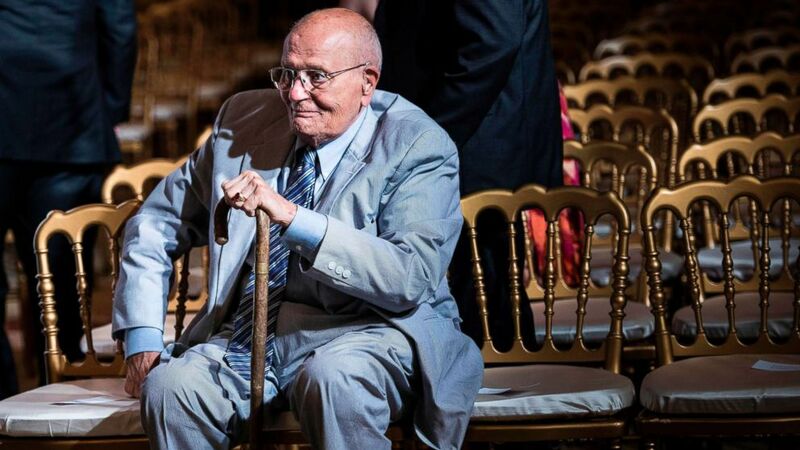 (Brendan Smialowski/AFP/Getty Images, FILE) Representative John Dingell sits after listening to President Barack Obama make a statement in the East Room of the White House, July 18, 2013. "The Congressman’s grit, humility and humor taught us all that we can disagree without being disagreeable, while still finding common ground and working together to get things done" she added. Even in retirement, Dingell was widely appreciated for his colorful humor, particularly on Twitter. He was known to rib Republicans. While Sen. John McCain, R-Ariz., was battling cancer, Dingell wrote on Twitter that he looked forward to catching up with him soon. "My friend @SenJohnMcCain is a dogged ole S.O.B.," he wrote. "Sharp as hell and tougher than a $2 steak." My friend @SenJohnMcCain is a dogged ole S.O.B. Sharp as hell and tougher than a $2 steak. I look forward to catching up with him soon. McCain died in August 2018 at the age of 81. In 2014, then-President Barack Obama presented Dingell with the Presidential Medal of Freedom. In a Facebook post, he asked who wore it best and shared photos of Obama placing the medal on him and and actress Meryl Streep. 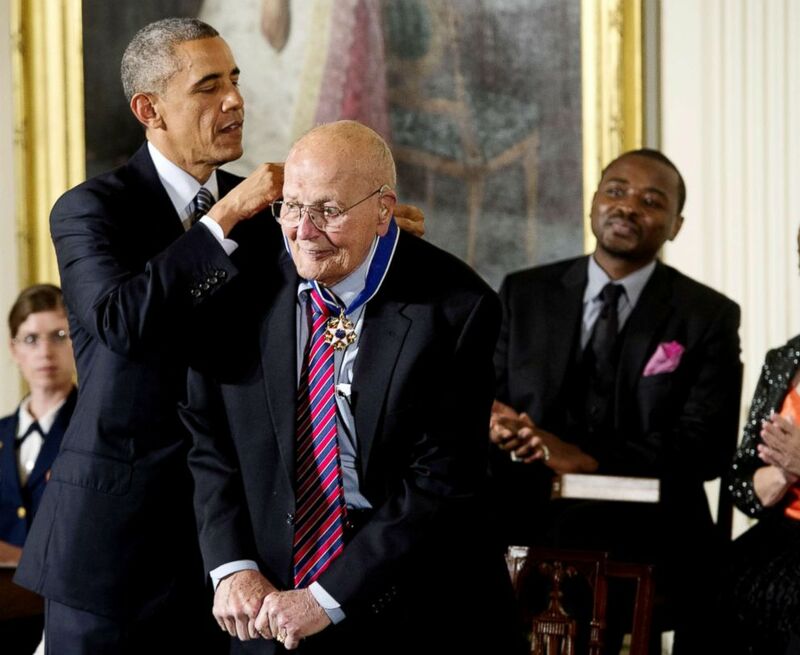 (Michael Reynolds/EPA via Shutterstock) John Dingell, the longest serving Member of Congress in US history, is awarded the Presidential Medal of Freedom by US President Barack Obama, left, during a ceremony in the East Room of the White House, Nov. 24, 2014. Obama shared a number of Dingell's accomplishments in a statement, including his work on Medicare, the Affordable Care Act and helping to rescue Detroit's auto industry during Obama's tenure in office. Whitmer ended her Twitter thread calling for Dingell's life to be an example for the country. "In this divisive time, may we all draw wisdom and inspiration from the truly remarkable life of Congressman John Dingell, and may we all continue to learn from his example of selfless public service as we work to build a better future for our state," she wrote.